The cutting edge in investigative roleplaying joins forces with the game that started it all - with spine-chilling results. In what can only be described as his masterwork, acclaimed expert on the eldritch Kenneth Hite weds his encyclopedic command of vivid historical detail to his piercing mastery of H.P. Lovecraft's classic horror tales. Trail of Cthulhu brings the cosmic malignity forward into the 1930s, a time when the creeping madness of the Great Old Ones intermingles with the sweeping cruelty of global totalitarianism. The revolutionary GUMSHOE rules system, by award-winning designer Robin D. Laws, will change the way you play investigative games. It speeds and streamlines play, ensuring that, as your characters plunge into rotting farmhouses, forbidden libraries, and frigid Antarctic labyrinths, they'll always get the clues they need to move ever onward. Onward toward their fated confrontation with ancient truths too appalling for the mind to assimilate. Choose your mode of play: a Purist spiral into mind-blasting despair, or lurid two-gun Pulp. Fortify your investigators with 14 compelling Drives to get your characters into that crypt at night - and over 60 abilities, from Chtulhu Mythos to Explosives, to help them get back out. Includes three exciting campaign frames, for tweedy academics, jut-jawed G-men, or grimy traffickers in the uncanny, plus "The Kingsbury Horror," a complete introductory adventure. 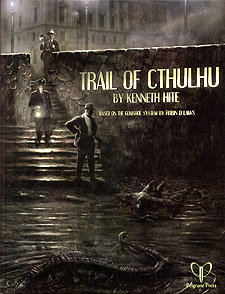 The Trail of Cthulhu - a whole new way to go mad and die. An excellent Cthulhu based RPG system using the new GUMSHOE system, there is a lot of detail here and plenty of really excellent supplimental material.